How was your weekend? Mine consisted of the usual mischief, plus hiding from the sun. On Saturday I went down to Boots in Brighton for a nosey round the shelves. My goodness but it’s changed. They really seem to be going for more niche brands and cult skincare from around the world. It’s a carefully curated edit a bit like you’ll find in the M&S beauty department. The bad news is that Nuxe seem to have gone, but the good news is that lots of interesting looking goodies have taken their place. Chief amongst them is cult Greek skincare brand Youth Lab, and as luck would have it I’ve been trying out their excellent CC cream. Apparently one of these sells every 60 seconds around the globe, so we in the UK are a little late to the Youth Lab party. 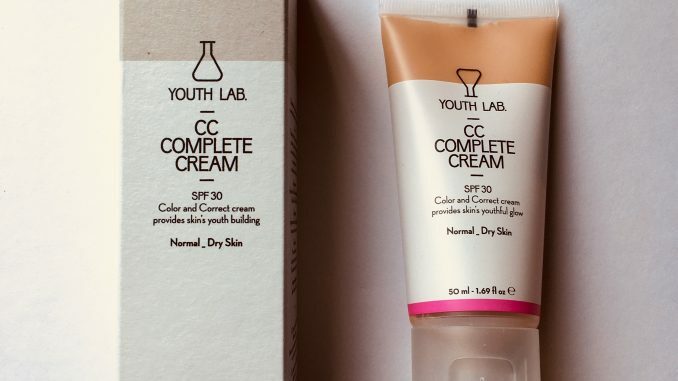 Youth Lab CC Complete Cream comes in two varieties, for normal to dry skin and oily skin. It’s a multi-functional cream which moisturises, protects, corrects and covers to give a natural and flawless finish. It’s a little bit skincare, a little bit make up and a whole lot of Greek skin science. 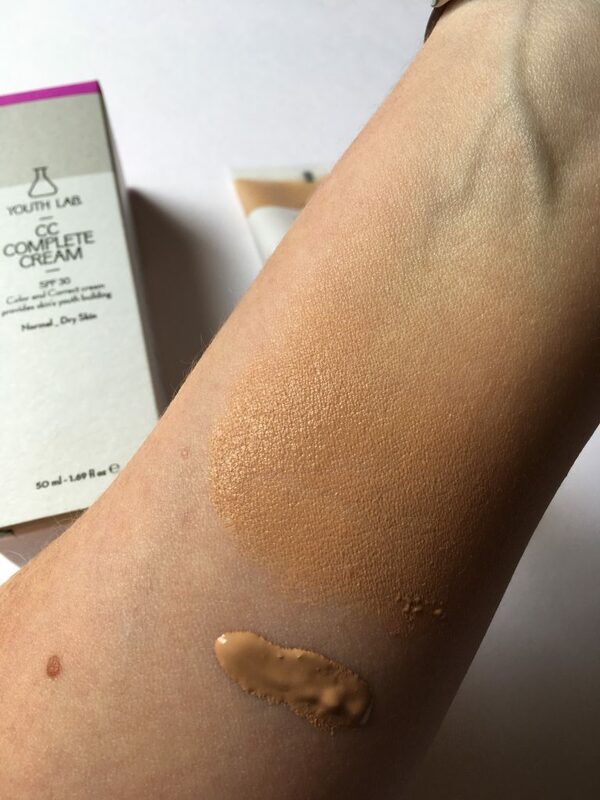 The CC cream contains natural colour pigments which adjust to every skin tone to give an even coverage. As you can see below, it’s quite warm and biscuity straight out of the tube (a bit like La Roche Posay’s BB Blur cream). Don’t be scared of the biscuitiness – it doesn’t linger, as the cream is designed to adjust to match your skin tone. At first application I thought it was going to be too dark for my very pale skin. However, within 30 minutes it had lightened up and was a perfect match which then stayed put all day. The coverage is mid-toned, halfway between matte and glow, so your skin’s natural sheen can still shine through. Great for a ‘your skin but better’ kind of vibe. It’s a very thick cream, so you only need a little. I would expect the 50ml tube to last for many months. I found the best application to be with an oval brush. Use it by itself for a light, natural look, or in conjunction with foundation if you like more coverage. 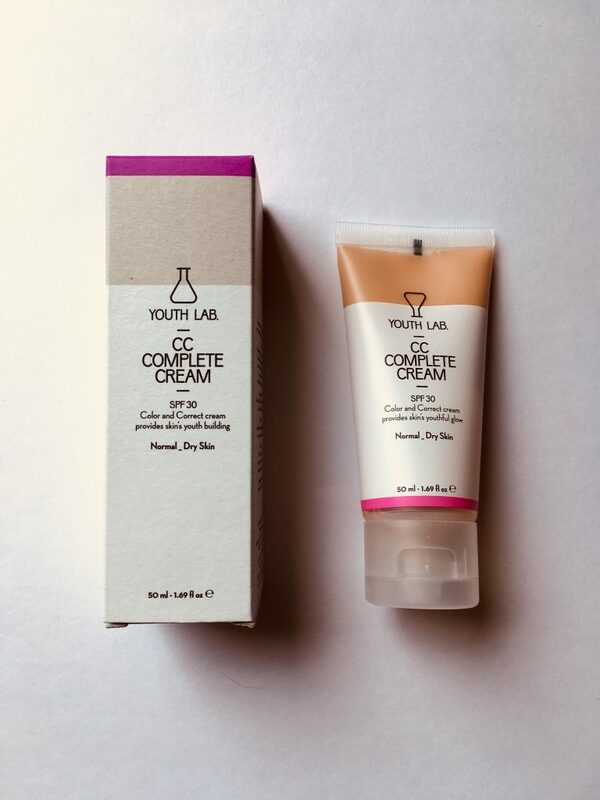 Youth Lab CC Complete Cream also contains SPF30 to protect the skin from UV rays and free radicals. Since you’re only using a small amount I wouldn’t rely on this entirely for your daily sunscreen. Think of it as more of a top up to your regular sun block.